The JW Michaels & Co Financial Services Market Data Report 2018 is now available. The data appearing in this compensation report was collected by comparing invoiced placements made by JW Michaels during 2018. The report presents compensations grouped by size and type of firm as well as by job title. The data represents compensation for various executive positions of top-tier financial services, legal, technology, and business institutions. JW Michaels compiled this information based on completed placements made by the company in 2018 including compliance officers, general counsel, patent counsel, IT, legal and risk management executives with investment banks, law firms and Fortune 500 companies in every industry. 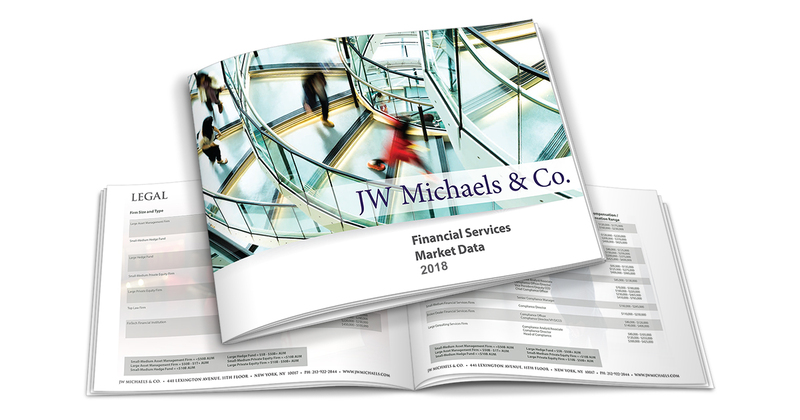 Enter your information below to download your complimentary copy of JW Michaels & Company’s Financial Services Market Data Report.